Originally uploaded by The One True Stickman. Heralding the first photo post from Flickr and previously mentioned here, the now-named iTower (Gromit) is progressing. The next step is building another chassis piece so he can stand up properly. The ports you see on top are technically the back of the machine. The stand piece will also house such things as the speakers, airflow, and possibly a fan, and make it possible to connect a monitor cable without tipping the whole rig over – currently the mac Video connector is pointing straight down, requiring some extra room. Normally it won’t be too much of a problem, given that he’s going to be a server, but we’ll need it occasionally. Oh, and it all runs! Debian Sarge installed and booting, though not quite all set up. I mostly wanted to make sure it was good to go before school started and before I finished things off. 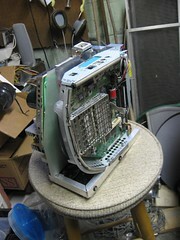 The last thing I want to have to do is pull it all apart again just to hook up a CD-ROM drive to (re)install. Once I’ve got further along (and got my conversion done website) I’ll post a full write-up with lots more pictures of construction detail. Promise. Since well before the analog board on my parents Bondi iMac died, I’ve been contemplating what to do with it. Well, ok, not what to do with it, just how. Since most of the bulk of an iMac is the monitor, the obvious solution is to put the brains in a smaller box. There have been a number of ATX powersupply conversions – such as the kMac, this other site and a bunch of others – but I don’t have to do that, my power supply works fine. It’s just the monitor bit that doesn’t. Why go through all the bother of rigging a boxy ATX supply when I’ve got a working one with about the same form factor as the motherboard and it Just Works(tm)? This guy did it with his iBox and there’s the infamous 21-inch iMac. The only problems are 1) the iBox is sorta ugly, and 2) I don’t have any extra big monitors lying around to hack up even if I wanted to. So, since necessity is the mother of invention and insanity the father, we set higher goals: we want to take the guts (mobo, PS, hard drive, switch board, speakers, and irDA port) and stick them in a nice, Mac-looking box. Hopefully. We’ll tackle the size thing first. I can fit it in a box smaller than a NeXT cube, but (obviously) larger than the G4 Cube. The thing is getting the components together with in a way that a) uses as much stock cabling as possible, b) allows access to external ports, c) fits in the smallest box possible, and d) allows for adequate air flow and some service without complete disassebly. So far I’ve got the Motherboard assembly and power supply board mostly bracketed together and the hard drive mount integrated. We’re mostly good on (b) – the monitor port is slightly awkward, but this is probably going to be a server so heck – and (a) is doing spiffy except for the IDE cable. (c) is bigger than I’d like, but really can’t get any smaller. (d) will be fine, once I figure out the fan placement, and I’m doing as well as can be expected on the service end. PS replacement will require a lot of take-apart, but we have decent access to the HD and Proc./RAM. Once we’ve got that done up a little more, it gets itself more of a chassis structure of some sort (Still need more of an exoskeleton in some parts, legs, and (maybe) CD mount) and then we figure out how to make a decent looking box for it all. Simple, quoth the beautiful beast of theoreticals. Not so simple if you have great visions of nicely bent lexan and all that jazz, but we’ll cross that bridge after we burn all the others.